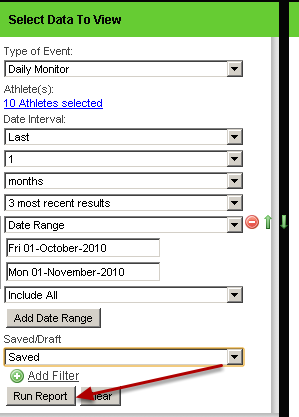 Reports allow you to view all of your athlete's information in a tabular format that can be exported or converted to a pdf. 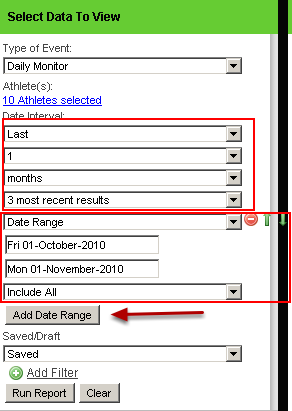 You can even include 2 date periods if you require, by clicking on "Add Date Range"
For this example we are selecting the last 1 month and only the 3 most recent in that time period, and then we are also including from 1-10-2010 to the 01-11-2010 and we have selected to include all data. Saved/Draft allows you to view any data which has been saved as a draft status. 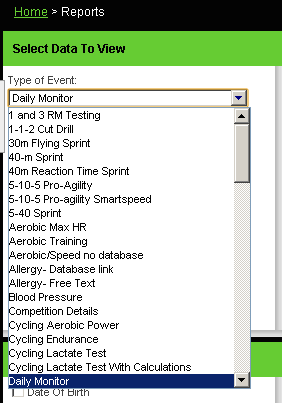 Most event types will be set as "Saved"
The Report appears on the right of the page. 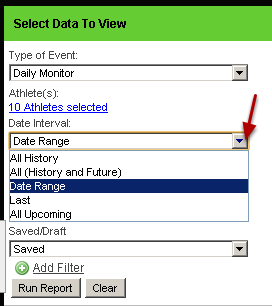 For this example we need to click the green "Add Filter" button (just above the run report button) and now we can add a filter based on the fields that are included in the daily monitoring form. 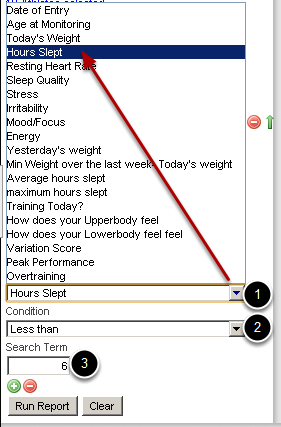 #6: Select the search term For this example we are going to select Sleep < 6 hours. When we click "Run" report it will be limited to the daily monitoring entries where sleep was less than 6 hours. To limit the report to ONLY show events where stress is high or very high and where sleep is <6 hours, you need to add in multiple filters (as shown here). The report that is generated includes only high stress and low sleep hours. 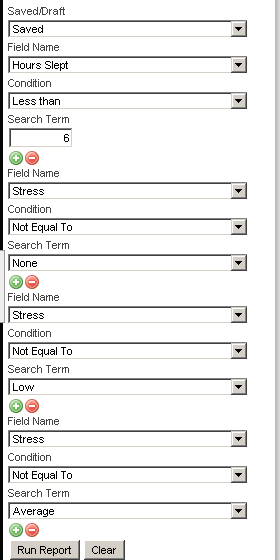 Place a tick beside the field name that you want to appear in the report on the right of the page and only these fields will appear. For the report below you can see that the fields have been limited to only a few fields from the form.